On November 28, 2012 at 11:30 a.m. EST, the House Judiciary Subcommittee on Intellectual Property, Competition and the Internet will examine “Music Licensing Part One: Legislation in the 112th Congress.” The hearing will likely address two competing bills pertaining to internet broadcasting: the hotly debated Internet Radio Fairness Act (IRFA) and the Interim Fairness in Radio Starting Today Act (Interim FIRST) [PDF]. Here’s a link to a live webstream of the hearing. IRFA, introduced in the House by Jason Chaffetz (R-UT), proposes that royalty rates for webcasters such as Pandora should be calculated based on the standard employed for satellite radio. This would likely lead to a considerable reduction in artist compensation, although it would certainly help the bottom line of larger webcasters such as Pandora. FMC submitted written testimony for the congressional record. 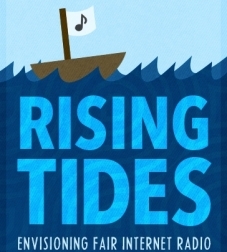 We’re also launching the Rising Tides: Envisioning Fair Internet Radio campaign, which outlines seven key points for musicians and advocates to defend in the fight for true fairness — for artists and broadcasters — with respect to royalty rates. It is important for musicians, advocates, and other members of the creative community to get informed and stay engaged as these issues are hashed out. Rising Tides is a great place to start to learn what’s at stake in the webcasting rates debate. The topic of internet radio royalties was discussed extensively at the recent 11th Future of Music Summit, which featured an interview with Tim Westergren of Pandora, keynote remarks from Senator Ron Wyden (D-OR, sponsor of IRFA in the Senate), and a panel called “Radio-active: Internet Broadcasting and Artist Compensation,” which featured panelists representing all sides of the issue. Want to get involved? Talk to us!